I’m going to get my Masters in Nutrition, and I’ve been reading some interesting food and health related books lately and thought I’d share them with you. This post is not nerdy to me at all, but for those of you who are not into that – look out – nerd alert. Oh, and these are all Google images. For my birthday, one of the gifts Bryan got me was The 150 Healthiest Foods on Earth. I really enjoyed sitting down and reading this book. 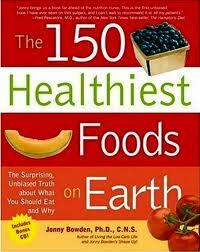 It literally just lists the 150 healthiest foods, what nutrients they pack and why they are good for us. It is organized by type of food, and then alphabetically, so it’s easy to reference later also. I found some interesting tidbits about foods I love too! For instance, I love kale and it is loaded with nutrients. Other top foods include, some predictable items like spinach and pomegranates, as well as some unexpected items like coffee and dandelion. I loved this book by the end of it, and I really want to read its brother The 150 Healthiest 15-Minute Recipes on Earth! 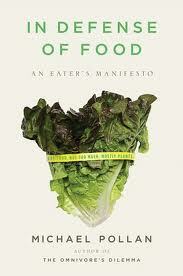 Upon recommendation from a great friend, I’ve also recently read In Defense of Food. It was a very interesting read, and similar to Food, Inc. Michael Pollan basically discusses how food has turned into something that is totally unfamiliar that what it used to be. Today, people eat food that is so processed that it’s not even food anymore; it’s a food product. The manner in which food is eaten has also moved from the dinner table to in front of the TV or in the car, usually alone. While food has become cheaper over the years in the form of mass produced processed food, it has also become much less healthy. Consequently, the healthcare system is taking a major hit in trying to battle obesity related illnesses. He supports spending money on good and healthy food in order to not need to spend the exponential amount of healthcare costs that would result from not taking care of oneself. He urges us to eat food, not too much, mostly plants. I urge all of you to read this book for a healthier you! 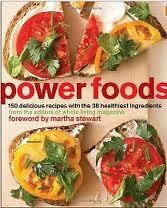 I recently purchased the recipe book Power Foods. It’s full of recipes loaded with nutrients. I like that it is categorized by meal type and that each recipe has a picture of the dish. I haven’t tried any recipes yet, but I tagged a load of them, so expect some to pop up on the blog soon! 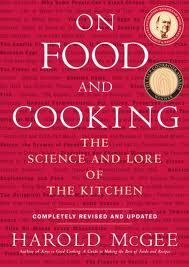 Currently, I’m reading On Food and Cooking: The Science and Lore of the Kitchen. Harold McGee discusses “where our foods come from, what they are and what they're made of, and how cooking transforms them.” I’m not that far into it yet, but I really like it. Any food lover should probably read this book! Do you have any food/nutrition/health related books that you’ve liked reading recently?